Pilot is a pen company, I’m sure everyone knows that but do you know that Pilot also makes a range of pen storage accessories. Pilot has a series of pen cases known as the Pensemble (Pen and ensemble). They come in a few different varieties, a single pen roll, 3 pen zipper case, 5 pen roll, a 3 pen combination roll and 5 pen combination roll. Pilot also has a premium range of pen storage products known the Somes Collection which costs a whole lot more. I was ordering some items from Amazon Japan so I threw in the Pilot Pensemble 5 pen roll into the cart. I paid about SGD$80 including international shipping for it. The Pilot Pensemble comes in a grey box and protected by a soft dust bag. This was a little more packaging than I had expected but it made the pen roll feels like a premium product. The Pilot Pensemble is made of high quality calf hide on the exterior and pig suede on the interior. (Do note that pigs are considered unclean by some faiths, so handle the pen roll with care and sensitivity. This pen roll might not be suitable for everyone to use.) I must say though I feel a little bad about buying a calf hide leather product, the leather feels really really soft, supple and luxurious. The interior feels just slightly velvety and soft. I do not worry about my pens getting scratched by pulling the pens in and out of their slots. The stitching is tight and nicely done. This is a high quality product by Pilot, I am impressed. The Pensemble comes with 2 larger pen slots and 3 regular sized ones. The thickest pens I own fit into both types of slots easily. Length wise, my OMAS Arte Italiana Art 2015 Liquid Green fits in the pen roll nicely. After 2 months of constant use, I found the clips of my pens do cause depressions on the interior suede. That isn’t serious since the pen roll is here to protect the pens. The pen clips are protected by flaps of the same pig suede. However the centre most regular pen slot do lack the clip protection because the flap doesn’t really want to stay down over the clip. It curls up slightly but after rolling the pen roll the neighbouring flap would help keep the flap down. The Pilot Pensemble lays flat on the table, allowing easy access to the pen slots. Holding my pen roll with the pens facing downwards and shaking it slightly, my unclipped pens still stay in their pen slots. The texture of the pig suede provides enough friction to hold the pens in their slots. 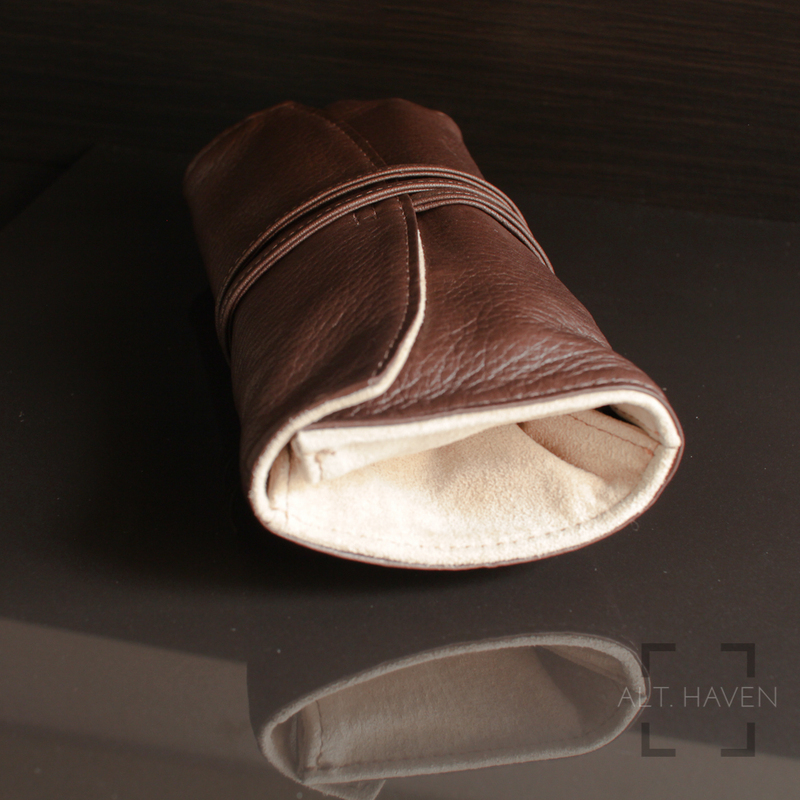 Once the pen roll is rolled up and secured via the leather string, it is a small and compact pen case. My only complain is the pen roll is clearly meant for the right handed people of the world of which I am not a member of. The leather string that’s used to secure the pen roll close starts from the right. Personally I am very inclined to unroll the pen roll with my left hand, I would always end up with the pens facing downwards. Though none of my pens have actually fallen out, it is still rather unsafe for my peace of mind if nothing else. I know it is quite impossible to hope for a left handed version but lefties out there do take note when getting a pen roll. The Pilot Pensemble as my very first pen roll is an excellent product. 5 pens is a nice little number to carry around. Though the nature of the leather doesn’t provide as much protection from falls as a hard case like Visconti Dreamtouch Leather 6 might, this pen roll is the perfect pen case for daily knocking around in my work bag. Do note though that if you are not careful you might get ink on the interior of the pen roll. The suede stains with ink easily and it might not be easy to clean it out. Also be careful with what cleaning products you use with leather products, I managed to wash the shine and oil out of my pen roll. My carelessness aside, the Pilot Pensemble is a pen roll I recommend wholeheartedly.